Press-in force and joint pressure are interdependent. The joint pressure occurs between the housing bore and the surface of the bush jacket. It can be understood as a measure of how securely the bush its in the housing. Together with other factors, the joint pressure inluences the amount of press-in force. Motorservice offers the calculation of the press-in force as a service. In most cases, the estimate of press-in force as per Fig. 1 is sufficient. 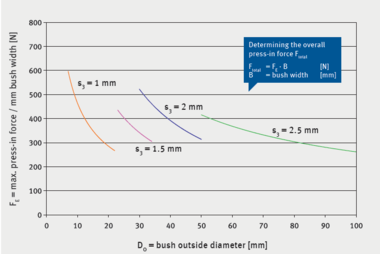 Figure 1 below shows the maximum required press-in force per mm of bush width. The curves represent the bush outside diameter DO and the bush wall thickness s3 to DIN ISO 3547. This calculation assumes a steel housing with a diameter of DG that has been adapted to the bush outside diameter DO. The selected ratio is DG: DO ≈ 1.5...2.